Guo G, et al. The cytomegalovirus protein US31 induces inflammation through mono-macrophages in systemic lupus erythematosus by promoting NF-κB2 activation. Cell Death Dis. 2018 Jan 24; 9(2): 104. Herling T W, et al. A Microfluidic Platform for Real-Time Detection and Quantification of Protein-Ligand Interactions. Biophysical journal, 2016, 110(9): 1957-1966. Kim K,et al. Antitumor effects of calgranulin B internalized in human colon cancer cells. Oncotarget, 2016, 7(15): 20368. Ho J C S, et al. Targeting of nucleotide-binding proteins by HAMLET—a conserved tumor cell death mechanism. Oncogene, 2016, 35(7): 897-907. Cheng X, Liu Y Q, Wang G Z, et al. Proteomic identification of the oncoprotein STAT3 as a target of a novel Skp1 inhibitor. Oncotarget, 2016, 5. Wang Y,et al.A nuclease that mediates cell death induced by DNA damage and poly(ADP-ribose) polymerase-1.Science. 2016, 354(6308). Ainscough J S, et al. Interleukin-1β Processing Is Dependent on a Calcium-mediated Interaction with Calmodulin. J Biol Chem, 2015, 290(52): 31151-61. Hu J, et al. Systematic Prediction of Scaffold Proteins Reveals New Design Principles in Scaffold-Mediated Signal Transduction. PLoS Comput Biol, 2015, 11(9): e1004508. Li H, et al. Penetrance of Congenital Heart Disease in a Mouse Model of Down Syndrome Depends on a Trisomic Potentiator of a Disomic Modifier. Genetics, 2016, 203(2): 763-770. Jung J G, et al. Notch3 Interactome Analysis Identified WWP2 as a Negative Regulator of Notch3 Signaling in Ovarian Cancer. PLoS genet, 2014, 10(10): e1004751. Deng RP, et al. Global identification of O-GlcNAc transferase (OGT) interactors by a human proteome microarray and theconstruction of an OGT interactome. Proteomics. 2014, 14(9): 1020-1030. Staudt N, et al. 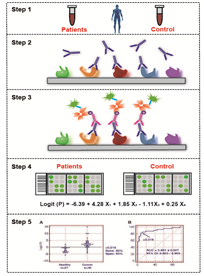 Development of an antigen microarray for high throughput monoclonal antibody selection. Biochem Biophys Res Commun. 2014, 445(4): 785-790. Ma TM, et al. Serine Racemase Regulated by Binding to Stargazin and PSD-95. J Biol Chem. 2014(289): 29631-29641. Chen Y, et al., Bcl2-associated athanogene 3 interactome analysis reveals a new role in modulating proteasome activity. Mol Cell Proteomics. 2013, 12(10): 2804-2819. Varjosalo M, et al. 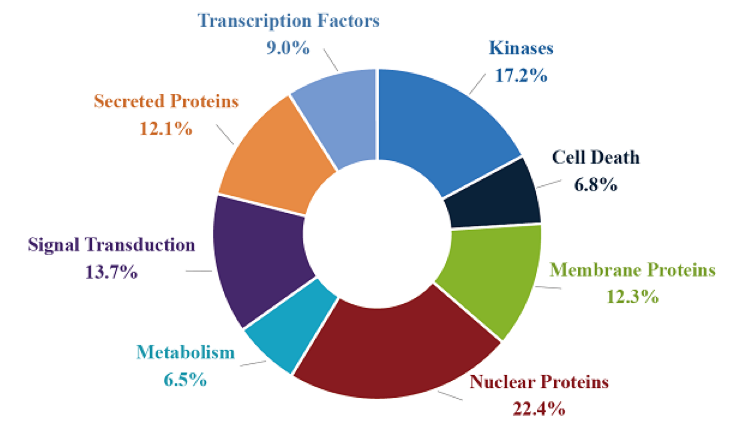 The protein interaction landscape of the human CMGC kinase group. Cell Rep, 2013, 3(4): 1306-1320. Huang Y et al. Global tumor protein p53/p63 interactome: making a case for cisplatin chemoresistance. Cell Cycle, 2012, 11: 2367-2379. Qin M, et al. 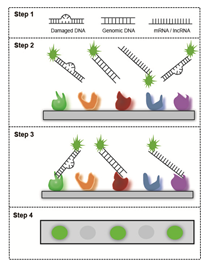 Circ-UBR5: An exonic circular RNA and novel small nuclear RNA involved in RNA splicing. Biochem Biophys Res Commun. 2018 Jun 24. Durruthy-Durruthy J, et al. The primate-specific noncoding RNA HPAT5 regulates pluripotency during human preimplantation development and nuclear reprogramming. Nature genetics, 2016, 48(1): 44-52. Zhang K et al. The C9orf72 repeat expansion disrupts nucleocytoplasmic transport. Nature, 2015, 525: 56-61. Howarth M M, et al. Long noncoding RNA EWSAT1-mediated gene repression facilitates Ewing sarcoma oncogenesis. J Clin Invest. 2014, 124 (12): 5275-5290. Kretz M, et al. Control of somatic tissue differentiation by the long non-coding RNA TINCR. Nature, 2013, 493(7431): 231-235. Fan B, et al. A human proteome microarray identifies that the heterogeneous nuclear ribonucleoprotein K (hnRNP K) recognizes the 5' terminal sequence of the hepatitis C virus RNA. Mol Cell Proteomics. 2014, 13(1): 84-92. Donnelly C J, et al. RNA toxicity from the ALS/FTD C9ORF72 expansion is mitigated by antisense intervention. Neuron, 2013, 80(2): 415-428. Barry G, et al. The long non-coding RNA NEAT1 is responsive to neuronal activity and is associated with hyperexcitability states. Scientific Reports. 2017, 7: 40127. Coll JM, et al. Herpesvirus Infection Induces both Specific and Heterologous Antiviral Antibodies in Carp. Front Immunol. 2018 Jan 24; 9: 39. Bigley V, et al. Biallelic interferon regulatory factor 8 mutation: A complex immunodeficiency syndrome with dendritic cell deficiency, monocytopenia, and immune dysregulation. J Allergy Clin Immunol. 2018 Jun; 141(6): 2234-2248. Gupta S, et al. Evaluation of autoantibody signatures in meningioma patients using human proteome arrays. Oncotarget. 2017 Apr 10; 8(35): 58443-58456. Chung BK, et al. Phenotyping and auto-antibody production by liver-infiltrating B cells in primary sclerosing cholangitis and primary biliary cholangitis. J Autoimmun. 2017 Feb; 77: 45-54. Gupta S, et al. Serum Profiling for Identification of Autoantibody Signatures in Diseases Using Protein Microarrays. Methods Mol Biol. 2017; 1619: 303-315. Washburn N, et al. 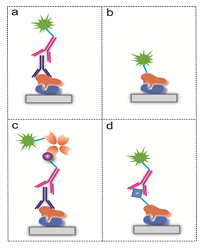 High-resolution physicochemical characterization of different intravenous immunoglobulin products. PLoS One. 2017 Jul 31; 12(7): e0181251. Huang Y, et al. Protein Array-based Approaches for Biomarker Discovery in Cancer. Genomics Proteomics Bioinformatics. 2017 Apr; 15(2): 73-81. Chung JM, et al. Identification of the Thioredoxin-Like 2 Autoantibody as a Specific Biomarker for Triple-Negative Breast Cancer. J Breast Cancer. 2018 Mar; 21(1): 87-90. Bremer HD, et al. ILF2 and ILF3 are autoantigens in canine systemic autoimmune disease. Sci Rep. 2018 Mar 19; 8(1): 4852. Li Y, et al. p27 is a Candidate Prognostic Biomarker and Metastatic Promoter in Osteosarcoma. Cancer Res. 2016, 76(13): 4002-11. Gowen MF, et al. Baseline antibody profiles predict toxicity in melanoma patients treated with immune checkpoint inhibitors. J Transl Med. 2018, 16(1): 82. Hu C J, et al. Identification of novel biomarkers for Behcet Disease diagnosis using HuProt array approach. Mol Cell Proteomics, 2017, 16(2): 147-156. Shi L et al. Application of high-throughput protein array in clinical screening for tumor markers. Int J Clin Exp Med, 2016, 9: 8529-8535. Ogishi M, et al. Delineation of autoantibody repertoire through differential proteogenomics in hepatitis C virus-induced cryoglobulinemia. Sci Rep, 2016, 6: 29532. Syed P et al. Autoantibody Profiling of Glioma Serum Samples to Identify Biomarkers Using Human Proteome Arrays. Sci Rep, 2016, 5: 13895. Delville M, et al. A circulating antibody panel for pretransplant prediction of FSGS recurrence after kidney transplantation. Sci Transl Med, 2014, 6(256): 256ra136. Bonsignori M, et al. An autoreactive antibody from an SLE/HIV-1individual broadly neutralizes HIV-1. J Clin Invest. 2014, 124(4): 1835. Taguchi A, Taylor AD, Rodriguez J, et al. A Search for Novel Cancer/Testis Antigens in Lung Cancer Identifies VCX/Y Genes, Expanding the Repertoire of Potential Immunotherapeutic Targets. Cancer Res, 2014, 74(17): 4694-4705. Yang G, et al. Identification of autoantigens recognized by the 2F5 and 4E10 broadly neutralizing HIV-1 antibodies. J Exp Med, 2013, 210(2): 241-256. Mias GI, et al. Specific plasma autoantibody reactivity in myelodysplastic syndromes. Sci Rep. 2013, 3: 3311. Charpin C, et al. New autoantibodies in early rheumatoid arthritis. Arthritis Res Ther, 2013, 15(4): R78. Zingaretti C, et al. Identification of new autoantigens by protein array indicates a role for IL4 neutralization in autoimmune hepatitis. Mol Cell Proteomics. 2012, 11(12): 1885-97. Sigdel TK, et al. Non-HLA antibodies to immunogenic epitopes predict the evolution of chronic renal allograft injury. J Am Soc Nephrol. 2012, 23(4): 750-63. Xu Z, et al. Systematic identification of the protein substrates of UDP-GalNAc:polypeptide N-acetylgalactosaminyltransferase-T1/T2/T3 using a human proteome microarray. Proteomics. 2017 Jun;17(11). Cossette S M, et al. Sucrose Non-Fermenting Related Kinase Enzyme Mediated Rho-Associated Kinase Signaling is Responsible for Cardiac Function. Circulation: Cardiovascular Genetics, 2016. Dwyer S F, et al. Identification of Novel Focal Adhesion Kinase Substrates: Role for FAK in NF&kappa;B Signaling. Int J Biol SCI. 2015, 11(4): 404. Cox E et al. Identification of SUMO E3 ligase-specific substrates using the HuProt human proteome microarray. Methods Mol Biol, 2015, 1295: 455-463. Lee Y I, Giovinazzo D, Kang H C, et al. Protein microarray characterization of the S-nitrosoproteome. Mol Cell Proteomics, 2014, 13(1): 63-72. Moore K E, et al. A general molecular affinity strategy for global detection and proteomic analysis of lysine methylation. Mol cell, 2013, 50(3): 444-456. Feijs K L, et al. ARTD10 substrate identification on protein microarrays: regulation of GSK3beta by mono-ADP-ribosylation. Cell Commun Signal, 2013, 11(5). Radu M, Rawat S J, Beeser A, et al. ArhGAP15, a Rac-specific GTPase-activating protein, plays a dual role in inhibiting small GTPase signaling. J Biol Chem, 2013, 288(29): 21117-21125. Tarrant M K, Rho H S, Xie Z, et al. Regulation of CK2 by phosphorylation and O-GlcNAcylation revealed by semisynthesis. Nat Chem Biol. 2012, 8(3): 262-269. Cox E,et al.Global analysis of SUMO-binding proteins identifies SUMOylation as a key regulator of the INO80 chromatin remodeling complex. Mol Cell Proteomics. 2017. Zhaoshou Y et al. A human proteome array approach to identifying key host proteins targeted by Toxoplasma kinase ROP18. Mol Cell Proteomics, 2017, 16. Venkataraman A, et al. A toolbox of immunoprecipitation-grade monoclonal antibodies to human transcription factors. Nat Methods. 2018 May; 15(5): 330-338. Sterner E, et al. Therapeutic Antibodies to Ganglioside GD2 Evolved from Highly Selective Germline Antibodies. Cell Rep. 2017 Aug 15;20(7):1681-1691. Hett E C, et al. 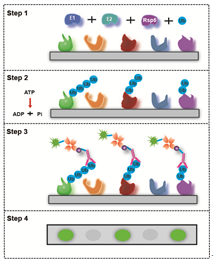 Selectivity determination of a small molecule chemical probe using protein microarray and affinity capture techniques. ACS Combinatorial Science, 2016, 18(10): 611-615. Iyama S et al. Drebrin: A new oncofetal biomarker associated with prognosis of lung adenocarcinoma. Lung Cancer, 2016, 102: 74-81. Liu, S et al. Characterization of monoclonal antibody's binding kinetics using oblique-incidence reflectivity difference approach.Taylor & Francis. 2015, 7: 110-119. Jeong J S, et al. 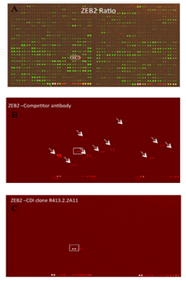 Rapid identification of monospecific monoclonal antibodies using a human proteome microarray. Molecular & Cellular Proteomics, 2012, 11(6): O111. 016253. To C, et al. Synthetic triterpenoids target the Arp2/3 complex and inhibit branched actin polymerization. J Biol Chem. 2010, 285(36): 27944-57.